Following the success of Dr Jeanette Tamplin’s first dementia choir, Musical Memories, seven more choirs for people and carers living with dementia will be introduced in Victoria and Tasmania. We spoke with Dr Tamplin about her ongoing project. Hi Jeanette, you’ve been working with therapeutic choirs in dementia since May 2016. How did you come to start working in this area? It all started with an NHMRC [National Health and Medical Research Council] and ARC [Australia Research Council] co-funded fellowship, which I’m half-way through now. My proposal was to explore the effects of therapeutic choirs specifically targeting people with early to mid-stage dementia who are still living at home with their family carers. We wanted to support carers in coping and adjusting in their role as well as people living with dementia. The first group we started in May 2016 was called Musical Memories, which I conducted alongside my Melbourne Conservatorium of Music colleague Dr Imogen Clark. Previous research into choirs for people with dementia has mostly focused on qualitative outcomes – for example, the pleasure and social benefits of singing. We’re looking at quantitative outcomes as well, which is quite difficult in dementia, looking, for example, at measuring the effects of choir participation on relationship quality, anxiety, depression quality of life and cognitive function. Are those individuals who participated in Musical Memories still singing? Well, yes, when we got to the end of the research trial period they all said, “We can’t stop, you can’t take this away!” They got a lot out of it and they really wanted it to keep going. We managed to secure some funding through an Austin health donation for another 12 months and are now looking for funding options post June 2018. We’ve also found a partner for the next stage of the research – a community aged-care provider, Uniting AgeWell. They believe this is a really affordable program that’s filling a gap in current service options for people with dementia living in the community and their family carers. Why have the choirs been so successful? I think because they’re not just about coming and having a cup of tea and talking about dementia; a lot of people don’t want to do that. People are often still trying to adjust to the “dementia” label, and that’s really hard. The choir is about doing something enjoyable and accessible that has individual benefits while still providing an environment for people to support each other. 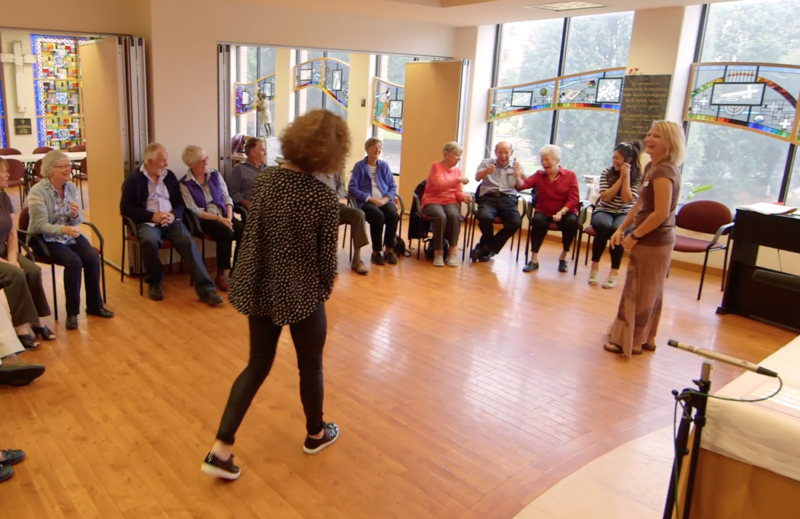 It was interesting to see in the short video that was made about the group – the carers seemed to be getting as much out of it as the dementia patients. Definitely! Carers need to be supported, both from the perspective of their quality of life, and for the cost they are saving society. Having people in aged-care facilities, as opposed to staying in their own homes, is expensive and often not very nice. If we help carers manage at home, by doing whatever we can to support them early on and nurturing the relationship between carer and person with dementia, that’s the ideal situation for everyone. In your career as a music therapist, has singing been your primary tool? Singing’s not my primary instrument, but I have been interested in therapeutic applications of singing for my whole career. My research has looked at a variety of things that singing can benefit. For example, singing to help people with communication after a stroke, singing to help people with respiratory function after a spinal cord injury, singing to improve speech and voice outcomes for people living with Parkinson’s disease. And have you found singing to have successful therapeutic outcomes in all of those research areas? Well, I am biased, but definitely, yes, and it’s something everyone can do. You don’t have to be a trained musician to use your voice. Sometimes people find it confronting; it’s very personal your own voice, it can be embarrassing. Sometimes people have been told that they can’t sing or that they’re tone deaf … But that’s why group singing’s kind of nice – you’re all in it together and you can kind of hide in the group a bit if you’re embarrassed. And it’s not about the quality of singing, it’s about the therapeutic process of joining together as a group. So why, in simple terms, does singing makes us feel so good? We know that when we sing there are a whole lot of neurochemicals released in the brain – endorphins, serotonin, dopamine. It also decreases cortisol, which is linked to stress, and increases feelings of empathy and social bonding. What’s next for your dementia choirs research? Well, we’re moving into the second stage of research, where we will be comparing people who sing in these therapeutic dementia-specific choirs with people who don’t on a range of quantitative outcomes. We’re going to set up seven new groups next year: five in Melbourne, one in Bendigo and one in Tassie, which is really exciting. It’s a randomised controlled trial so people who enrol will be randomly allocated to either attend a choir straight away or wait for 6 months before joining. A loaded question … Does music therapy have enough recognition and enough funding? No. Unfortunately in many cases it’s still pretty fringe in terms of healthcare funding. When I started working in the industry 20 years ago most people hadn’t heard of music therapy, and that’s not the case so much now. It’s had more coverage in the media and people are really fascinated with the effects of music on the brain. But still, when it comes down to spending the money, it’s often considered an optional extra. That’s why we really need to do these types of research projects – to demonstrate that music therapy is a cost-effective way to treat neurological conditions such as dementia. I’m working on another project at the moment led by my MCM colleague Dr Felicity Baker. Our team received a NHMRC grant for over a million dollars for a National dementia research project in residential care. We will be looking at the effects of various forms of music engagement on depressive symptoms, cognitive functioning, neuropsychiatric symptoms, quality of life and caregiver burden as well as conducting a health-economic analysis. We are looking at whether people engaging regularly with music therapy are reducing anti-psychotic drugs and anti-depressants and are visiting the GP less frequently. If we can demonstrate that people who are regularly accessing music therapy are decreasing other costs then there’s a huge cost-benefit. Contact Dr Jeanette Tamplin for more information on participating in the MCM’s ongoing dementia research. The NNIDR Australian Dementia Forum runs 15-17 October, 2017, at the Melbourne Convention & Exhibition Centre. It is followed by the 17th Alzheimer’s Australia Biennial National Dementia Conference 17-20 October, 2017. Find out more about Music Therapy at the Melbourne Conservatorium of Music. Banner image: Video still. University of Melbourne.